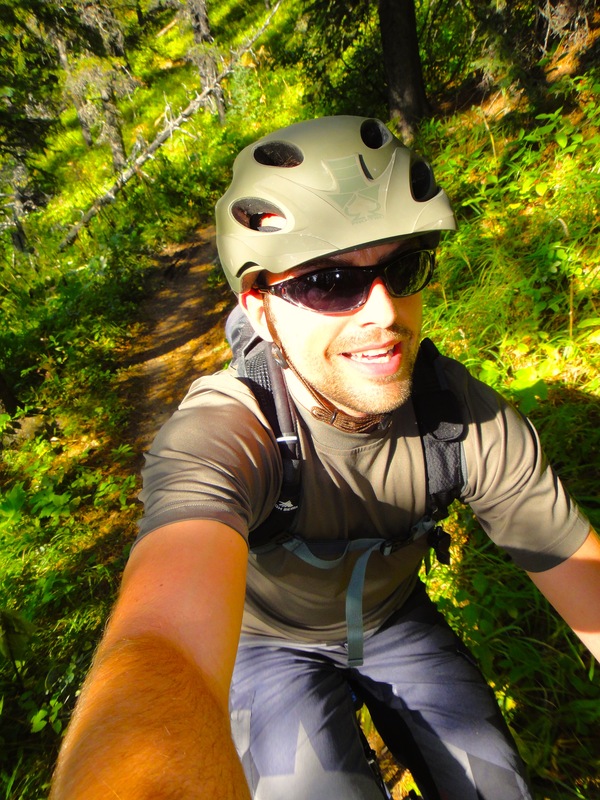 It wouldn’t be too hard to argue that Bragg Creek and Kananaskis are the epicenter for mountain biking in this province. Novice riders are now discovering what veterans of the sport have known for years; the trails at West Bragg Creek, Station Flats/Allen Bill, and Moose Mountain are some of the best around. For the purposes of this story, I’ll be focusing solely on the West Bragg Creek area, but don’t discount the other trail networks nearby. 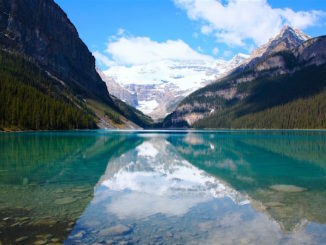 West Bragg Creek, the closest outdoor recreation area to Calgary, has exploded in popularity since 2011 when a group of volunteers from the Greater Bragg Creek Trail Association developed over 32km of flowy singletrack in the pristine wilderness of the foothills. 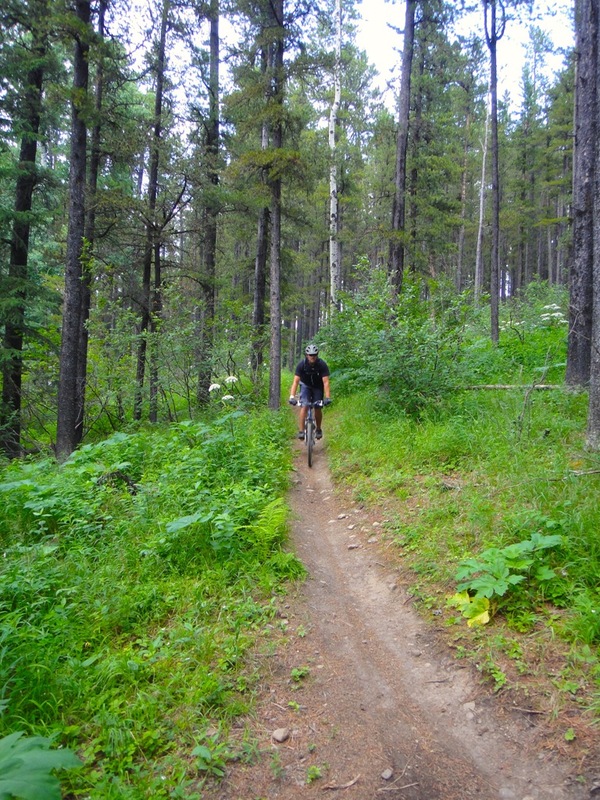 The group continues to design, build, and maintain the network of trails in the Bragg Creek area. 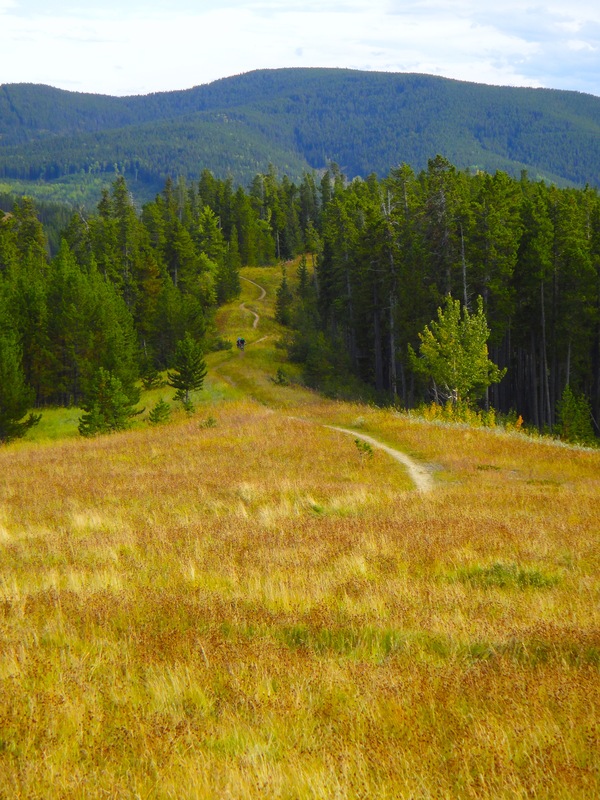 The vast majority of the trails in West Bragg Creek are classified as intermediate and are marked with a blue square, similar to the system used at ski/snowboard resorts. 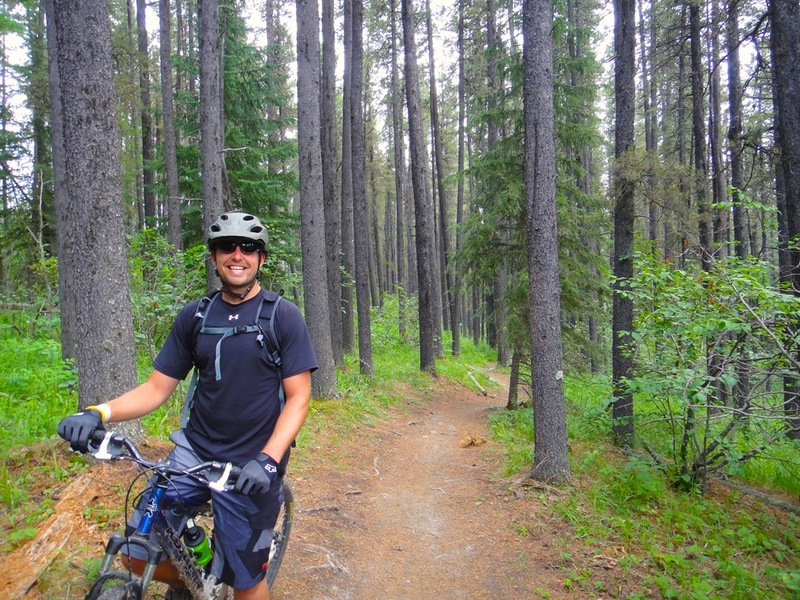 There are a core handful of dedicated individuals that do the majority of the trail building and maintenance in West Bragg Creek. They are always on the lookout for additional bodies, so if you’d like to get involved consider volunteering for a trail day and do your part to ensure this trail system remains awesome! All of the information for trail days can be found by visiting the Volunteer Calendar. 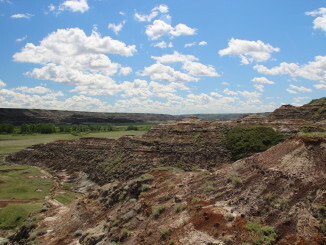 Dependent on weather and conditions, most trails are rideable from mid-May through to October. That being said, with relatively sparse snowpack during the winter and the recent rise in popularity of fat bikes, the Bragg Creek trail system sees riders twelve months of the year. 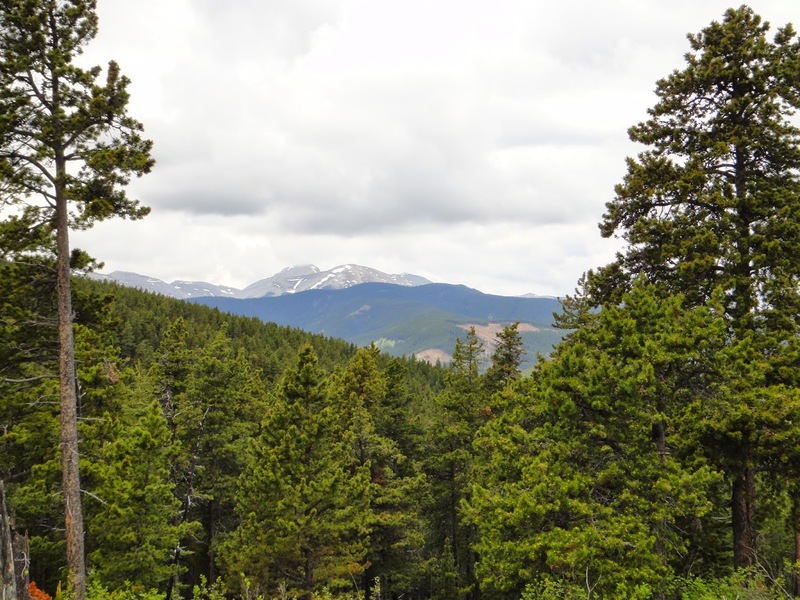 All of the trails are considered multi-use, meaning they are accessible by other users, not just the fat-tire variety, so it’s important to pay attention for hikers, equestrian users, and cross-country skiers when you’re out there. 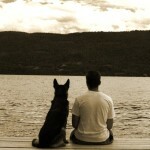 Dogs are welcome on the trails, but remember to keep Fido on a leash while in the parking area. The author riding the Boundary Ridge Trail. Photo Credit: Jeff N.
It’s not just other humans that you need to be aware of either. Even though Bragg Creek is only 45 minutes west of Calgary it is located in bear country, so you should plan and prepare accordingly. Mountain biking is much faster and quieter than hiking and therefore the opportunity to surprise a bear around a blind corner is increased. 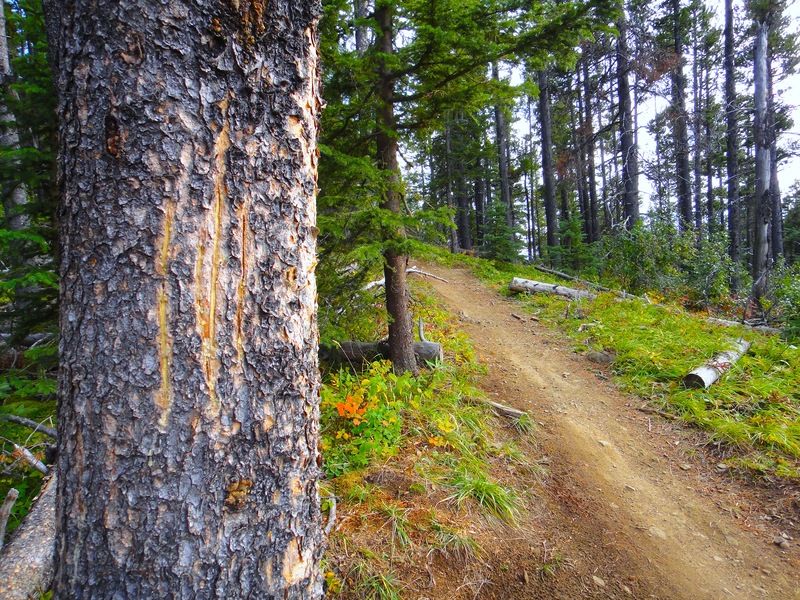 Many of the bear safety tips that are directed towards hikers are also applicable to mountain bikers, but some need to be adapted to suit the differences between the two sports. For additional information about biking in bear country please consult WildSmart’s website. It’s not an easy task to select a favourite trail as they’re all so good, but if I had to narrow it down my top three would be Merlin, Bobcat, and Snakes & Ladders. Bobcat and Snakes & Ladders can be accessed by a couple of different trails, but Ranger Summit seems to be the most popular, while Merlin is accessed by Braggin’ Rights. 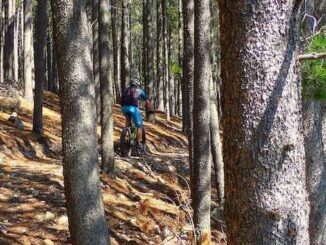 Each of those three start with hearty climbs through forested singletrack, ensuring the rider earns his/her turns before reaping the rewards. The fun truly begins after you reach the summit as you can expect fast, cruisy downhill, banked corners, bridges, and varied terrain, followed by pumping adrenaline and feelings of intense euphoria! Liking those trails as much as I do can actually be a hindrance because I am reluctant to explore different trails for fear that they might not live up to the standards of my favourites. But I keep reminding myself that variety is the spice of life and those unexplored areas might be full of unexpected goodness! 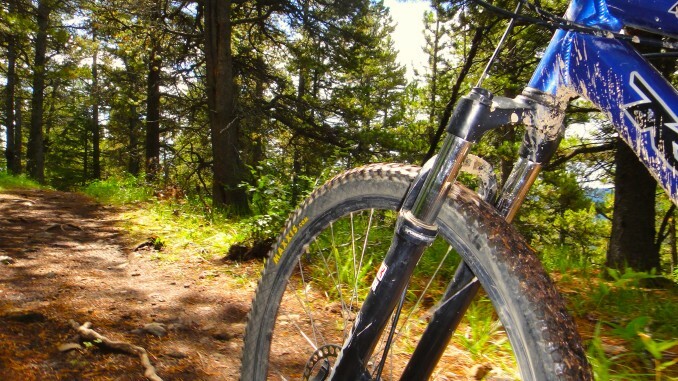 If you’re new to the sport or a seasoned vet, West Bragg Creek offers you some spectacular scenery coupled with world-class mountain biking. Time to get back in the saddle and make those legs burn; you’ll be happy you did! The author completing the descent on Strange Brew. Notice the smile! Photo Credit: Jeff N.
For additional information about the trail systems in Bragg Creek please refer to Trail Forks, the Greater Bragg Creek Trail Association, the Calgary Mountain Bike Alliance, or the Alberta Parks website. All have detailed trail information, reports on the latest conditions, trail etiquette, maps, and much, much more. Have Fun & Ride Safe Out There!